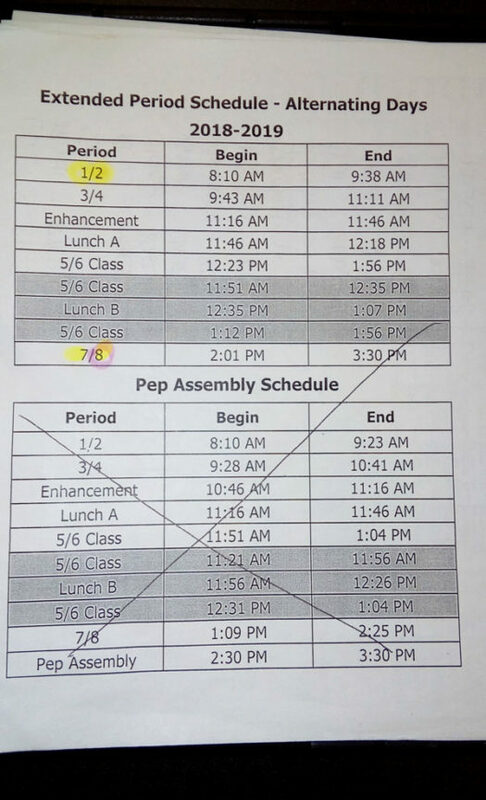 For the 2018-2019 school year, the Shawano School District decided to change the start and end times of each school in the district to start at 8:10 am and end at 3:30 pm. As the first six weeks of the school year wind to a close, students and staff have formulated opinions on the time change and how it has affected the district. McKenzie Trinko, a senior at Shawano High School, was skeptical about the change upon first hearing about it. “Before it was enacted, my initial opinion was that it was wrong, because everything would get pushed back including sports and work,” Trinko clarified. Due to the original backlash that the time changed received, not only was she leery about the change for herself, but also her peers. “In our community, with the agriculture aspect around here, people can only do certain jobs at certain times. For example, if you can only milk cows at 4 p.m. and we get out at 3:30, that isn’t possible,” Trinko noted. Her opinion has shifted after the first few weeks. Rehearsals for the play and other after school events have been later than she was used to in the past, which she does not mind, but Trinko mentioned that she does wish she had more time in the afternoons to work. Full time father and science teacher Mr. Matthew Brunette has been adjusting to the time change as well. “Because of the time change, my wife brings my kids to school, and that wasn’t something I worried about before. Now, she cannot bring the children in on Wednesday mornings, so I have to, which is one way the change has impacted my family. I’m still getting into the routine of it,” Mr. Brunette said. He has noticed a change in his students already, stating that they appear more alert in the morning. “As a teacher of high school kids, they think better because they are here later. Hopefully that translates to a better comprehension for students,” Mr. Brunette said. Shawano High School counselor Mr. Brian Bloesl also thinks that the time change will have a positive impact on students. “Studies have proven that kids who stay up later will sleep later, so it should be beneficial to them as a whole to go to school later,” Mr. Bloesl said. Though there has not been tested improvement, Mr. Bloesl was confident that, if other schools can make later start times work in their district, then Shawano School District made a smart choice by changing school start and end times as well. After she discussed the change with a student at Shawano Middle School, Trinko had a final thought about fellow students adjusting to the time change.